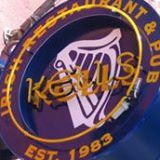 Kells Irish Restaurant & Pub is one of Seattle's favorite hideaways. Situated in Post Alley above the historic Pike Place Market Kells is a fine way to round up a day's sightseeing or browsing at the market.Like Irish Music 7 nights a week! Happy hour, 3 to 7 PM daily.